May 1, 2008 - DV, dorsal ventral; Ero1L, ER oxidoreductin 1 â like; ESO, external sensory or- ... cells accumulate high levels of Notch protein in the ER and. Dec 20, 2006 - for activation of the inflammasome during Francisella infection. Thomas Henry, Anna Brotcke, David S. Weiss, Lucinda J. Thompson,. Oct 19, 2004 - experiments suggest that BMP signaling is required for normal maintenance of ...... digested with NotI to free the insert from the vector, and size-. Mar 13, 2012 - signaling at fertilization, the embryo will fail to implant and/or develop to term (1). .... polar body by 1 h after ICSI, whereas the Ca2+-insulated ICSI eggs remained .... 2PN, two pronuclei; 3PN, three pronuclei. Miao et al. The Journal of Cell Biology, Volume 147, Number 1, October 4, 1999 77â87 http://www.jcb.org. 77 .... ErbB3/ErbB4 ligand neuregulin-1 (NRG1), but not the. May 26, 2011 - M. Brodsky: Frances. ... associated clathrin light chain (CLC) subunits (Brodsky et al., ...... scholar of the Howard Hughes Medical Institute. ozone stress, plastoglobule osmiophilicity decreased in wild-type apple and remained low in fib4 KD trees; ... (Winkenbach et al., 1976; Knoth et al., 1986; Emter. Feb 23, 2012 - technology, claudin also mislocalized away from tight junc- ... University of Colorado Denver, School of Medicine, Reproductive Sciences/ Mail. Feb 17, 2011 - dria supply energy to the cell for a variety of cellular activities. However ...... shop and prepared in Adobe Illustrator. Additional assays. May 6, 2004 - domain of ephrin-B2, and hence reverse signaling, is not required during early vascular development, ..... however, they expired within 24 h.
Feb 15, 2010 - self-renewal of cancer-initiating cells in other malignancies, we studied the role ...... ligand-induced proteolytic release of intracellular domain. Feb 8, 2012 - Open Access. Lipid raft/caveolae signaling is required for. Cryptococcus neoformans invasion into human brain microvascular endothelial cells. © 2012 Long et al; licensee BioMed Central Ltd. 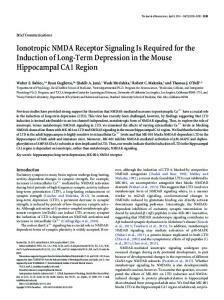 This is an Open Access article distributed under the terms of the Creative Commons Attribution License (http://creativecommons.org/licenses/by/2.0), which permits unrestricted use, distribution, and reproduction in any medium, provided the original work is properly cited. to the host cell’s surface in order to resist the flow of blood. It is generally accepted that the fungal capsule is the major virulence factor of this pathogen (reviewed by ). Real-time images have shown that the C. neoformans cells may become trapped within the microvessels in the brain, and subsequently, enter into the brain through the parenchyma . Several mechanisms are possible for this transmigration process [6-12]. For example, hyaluronic acid (HA), produced by the hyaluronic acid synthase gene (CPS1) of C. neoformans, plays a role in the adhesion of the fungal cells to endothelial cells [9,13]. We have demonstrated that HBMEC CD44 is the primary receptor for C. neoformans infection . Accordingly, the adherence of C. neoformans in the circulating blood to BMEC may be secured by the C. neoformans-produced HA and HBMEC CD44 interaction (the adhesion step). Then, the fungal cell triggers host signaling pathway(s) to facilitate its internalization (the invasion step). One feature of this process is the ability of C. neoformans to induce morphological changes in HBMEC, such as: membrane ruffling, irregular nuclear morphology and swelling of the mitochondria and the ER . These findings suggest that C. neoformans is able to induce actin cytoskeletal reorganization of the host cells. Furthermore, activation of host PKCa is essential for C. neoformans internalization into HBMEC . During C. neoformans infection, PKCa activation by phosphorylation is induced and PKC enzymatic activity is detected in the HBMEC membrane fraction. PKCa activation is a CPS1/CD44-dependent process. Blockage of PKCa function attenuates actin filament activity during C. neoformans invasion. Moreover, treatment with cytochalasin D, an actin disrupting reagent, can effectively block C. neoformans invasion into HBMEC in vitro . Thus, the host PKCa action on C. neoformans internalization into HBMEC may be mediated via actin filament activity. C. neoformans invasion into HBMEC is sensitive to the filipin treatment , which extracts cholesterol from membrane lipid rafts. It is generally accepted that endocytosis is mediated by membrane lipids or rafts. We have found that, in the presence of C. neoformans, the HBMEC lipid raft marker ganglioside GM1 can influx into the cytosol and accumulate in the perinuclear region . The uptake of GM1 suggests the involvement of lipid raft endocytic pathways. An intriguing question raised is how C. neoformans builds its distinct uptake mechanism via lipid raft endocytic routes. This question is complicated by the fact that endocytosis is comprised of multiple mechanisms, i.e., caveolae-dependent, clathrin-dependent mechanisms, pinocytosis, macropinocytosis, and phagocytosis [17-19]. Upon C. neoformans and HBMEC engagement, a subpopulation of CD44, Cav1, and actin translocates to the host membrane rafts . migrates inward in HBMEC along with actin filaments but not with the microtubule cytoskeleton. Together, our results suggest that C. neoformans invasion into HBMEC is linked to the lipid raft/caveolae-dependent endocytotic process and that Cav1 plays an essential role during this invasion process. Figure 1 Effect of CD44 membrane distribution on the Cav1 knockdown HBMEC. DAPI was used to stain nuclear DNA (blue) and CD44 was stained with the anti-CD44 monoclonal antibody and rhodamine conjugated secondary antibody (red). Top panel: membrane distributions of CD44 without (left panel) or with (right panel) the incubation of green C. neoformans strain C1186. Lower panel: HBMEC were treated with Cav1 siRNA in the presence (right column) or absence (left column) of C. neoformans cells (strain C1186). Magnified images were boxed and shown in the bottom panel. Bar: 20 μm. taken from the lower chamber and plated for counting of CFU. The lower chamber was replenished with 100 μl fresh culture medium. Simultaneously, the integrity of the HBMEC monolayer was assessed by measurement of the TEER. Three measurements were made at each timepoint for each sample. Figure 2 Effect of Cav1 siRNA on HBMEC. (A) A Western blot shows the Cav1 proteins from HBMEC with the following treatments: lane 1: mock; lane 2: random oligonucleotides; and lane 3: Cav1 siRNA. (B) An immunofluorescence microscopic image shows the reduction of Cav1 in the siRNA-treated HBMEC. Most cells show only DAPI stain, and one HBMEC still has some Cav1 signals (red). (C) The membrane raft marker ganglioside GM1 of HBMEC was stained with CTxB-FITC (green) and a C. neoformans cell (strain B-4500FO2) was stained with anti-GXM monoclonal antibody and rhodamine conjugate (red) (lower panel). The upper panels (Mock) are the controls without incubation with C. neoformans cells (strain B-4500FO2) (+Cn cells). The right column is HBMEC with Cav1 siRNA treatment (Cav1-KD) vs. the control (left column). (D) The Metamorph program associated with our fluorescence microscope was used to scan images with 5~10 random fields, and then used the statistical package GradPad Prime 5 to quantitate the readings. Analysis of variance shows significant increases in the GM1 signals in the presence of C. neoformans cells (P = 0.0029), but no different in the siRNA treated samples. Figure 3 Effect of C. neoformans on the adhesion and invasion of HBMEC in the Cav1 knockdown HBMEC. HBMEC cells were pretreated with (1) mock, (2) random oligo control, and (3) Cav-1 siRNA, before (A) the adhesion and (B) the invasion analyses. The treated samples were incubated C. neoformans strain C1186 (105 cells) for 3 hr and then the slides were prepared for immunofluorescence imaging (see Materials and Methods). The mock sample (lane 1) was designated as 100%, and the effects of siRNA were indicated by percentage over the control, respectively. Each bar represents the average of four different experiments ± SD with P < 0.01. 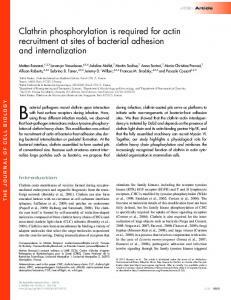 Detailed adhesion and invasion assays are described in Materials and Methods. The statistical analysis of the data from our in vitro studies involved analysis of variance (ANOVA). The dependent variable was the associated percent of cells or CFU while the independent fixed factors were the treatments (Cav1 siRNA). Raw data was entered into EXCEL files and automatically converted to statistical packages. ANOVA and co-variates were followed by the Newmann-Keuls test, to determine the statistical significance between the control and treatment groups. P < 0.05 was considered to be significant. Anti-Cav1 siRNA (pmole) Figure 4 Effect of Cav1-knockdown HBMEC on C. neoformans transmigration across the monolayer. HBMEC (104 cells) were seeded on the collagen-coated transwells for four days, until transendothelial electric resistance (TEER) reached > 250 μΩ/cm2. The coated cultures were treated with control oligo or Cav1 siRNA, either 10 or 20 pmoles, in the 0.5 mL upper chamber, for 2 days before the transcytosis studies. CFU were counted from the lower chamber of the transwell at 4 and 8 h after the addition of C. neoformans (n = 3). Analysis of variance shows significant decreases in transcytosis ability in the Cav1 knockdown HBMEC (P = 0.011). Figure 5 Colocalization of Cav1-GFP and CD44 on the surface of HBMEC. HBMEC were transformed with Cav1-GFP (1b, green). DAPI was used to stain nuclear DNA (1a, blue), and CD44 was stained with an anti-CD44 monoclonal antibody and Rhodamine conjugate (1c, red). An overlaid image was displayed on the right, showing some yellow signals (1d, arrows). Figure 6 Induction of Cav1 phosphorylation during C. neoformans infection. (A) HBMEC were infected with C. neoformans B-4500FO2 for different time periods, and then cell lysates (50 μg) were blotted and probed with an anti-phospho-Cav1 (Tyr-14) antibody. A time course study of Cav1 phosphorylation at 0, 5, 10, and 30 min is shown. b-actin was used as the loading control (second row). The ECL films (protein blots) were scanned by the software ImageMaster 2D Platinum 6.0 for quantitative and graphic analyses (lower panel). The total intensity of all bands is 100%. The relative intensity of the bands is indicated on the y-axis (n = 3). (B) Distribution of Pi-Cav1 during C. neoformans infection was examined by immunofluorescence microscopy. Untreated HBMEC were used as the control (1), or the HBMEC monolayer was incubated with 106 C. neoformans strain B-4500FO2 for (2) 5 min and (3) 30 min. Pi-Cav1 was stained with anti-phospho-Cav1 (Tyr-14) and second antibody-FITC conjugate (green). Nuclei were stained with DAPI (blue). Bar: 15 μm. of hyaluronic acid (HA), we then tested whether HA by itself could stimulate the phosphorylation of Cav1. As shown in Figure 7A (lines 4, 5), the Cav1 phosphorylation was increased in a hyaluronic acid-dependent manner. Thus, phosphorylation regulation of Cav1 is an HA-CD44 dependent process. Filipin was used to perturb the membrane lipid raft structure on HBMEC. Cav1 phosphorylation was stimulated by C. neoformans B-4500FO2 first, but this induced phosphorylation level was decreased as the filipin concentration increased (Figure 7B). Therefore, the filipin treatment reduced an already induced level of phophorylation, and/or prevented the C. neoformansinduction of phosphorylation. These results suggest that Cav1 phosphorylation might take place at the membrane lipid rafts and/or that Cav1 phosphorylation requires an intact membrane raft structure. membrane and pericentrosomal region close to the nucleus, as thread-like structures, can be observed (Figure 8, 4th column). This can be vividly observed as the yellow/orange signals in the overlaid images. This result raised an interesting possibility that the trafficking of Pi-Cav1 may be linked to the b-actin cytoskeleton system. A similar study was performed to study the relationship between tubulin and Pi-Cav1. Although tubulin staining displayed a random, thread-like network throughout the cytosol in HBMEC, there was no overlapping with Pi-Cav1’s long thread-like structures (Figure 8, bottom panels). In the perinuclear staining, there might be some overlap between Pi-Cav1 and tubulin, but it was not significant. Thus, Pi-Cav1 trafficking inside the HBMEC may be a microtubule-independent process. Figure 7 Induction of Cav1 phosphorylation mediated by the HA-CD44 pathway. (A) HBMEC were treated with 106 C. neoformans strains B-4500FO2 (CPS1+) or C559 (cps1Δ), or treated with 1 and 2 μg hyaluronic acid (HA) for 10 minutes (A). The cell lysates were prepared and immunoblotted for the detection of the phosphorylated form of Cav1 (top row). b-actin was used as the loading control (second row). The quantitative and graphic analyses (lower panel) were described in the legend of Figure 6. 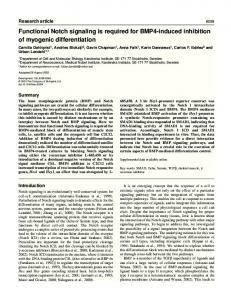 (n = 4) (B) HBMEC cells were pre-treated with filipin (0 to 5 ng) for 10 minutes prior to the treatment of 106 C. neoformans strain B-4500FO2 cells. The signals of Pi-Cav1 were then examined as described above. Figure 8 Immunofluorescence microscopy to examine phospho-Cav1 and b-actin localization during C. neoformans infection. The HBMEC monolayers were incubated with 106 C. neoformans strain B-4500FO2 for 0 min, 5 min and 60 min. In parallel, untreated HBMEC were used as a negative control, indicated as 0 min in the figure. b-Actin was stained with phalloidin-rhodamine conjugate (red) (second column) and the phosphor-Cav1 was stained with anti-phospho-Cav1 (Tyr-14) antibody and second antibody-FITC conjugate (green). Nuclei were stained with DAPI (blue). Bar: 15 μm. A similar study was performed in the bottom panel, in which tubulin was stained with anti-tubulin antibodies and rhodamine conjugate (second column) at the 60 min incubation time point. host CD44, membrane lipid rafts and Cav1 to analyze the mechanism of adhesion and invasion by this fungus. CD44 is the C. neoformans receptor on the lipid rafts/ caveolae of HBMEC . Here we initially demonstrated that CD44 was colocalized with Cav1 on the surface of HBMEC (Figure 5), supporting the notion that CD44 exerts its functions on lipid rafts. Lipid rafts are enriched in cholesterol, sphingolipids and raft proteins. These highly dynamic membrane structures may have a potential role as signaling platforms by clustering receptors used by pathogens. Caveolae are a special type of membrane lipid rafts. We therefore investigated whether their major component, Cav1, is involved in the C. neoformans invasion process. We found that the lipid raft marker ganglioside GM1 (Figure 2) can cluster around the C. neoformans adhesion site. Knockdown of Cav1 perturbed GM1 distribution (Figure 2), and, more interestingly, the CD44 proteins became randomly distributed and clustered into irregular islands on the surface of HBMEC (Figure 1B). This unique morphology has never been described in any cell type. As such, C. neoformans invasion into HBMEC is impaired (Figure 3B). The results suggest that Cav1 may play an important structural role in the reorganization of CD44, optimizing it to function as a receptor during C. neoformans invasion. Furthermore, transcytosis of C. neoformans was significantly reduced in the Cav1 knockdown HBMEC (Figure 4). Together, CD44 might be anchored on the lipid rafts/caveolae to form an entry site on the surface of HBMEC during C. neoformans infection. At present, there is no evidence to show a direct interaction between CD44 and Cav1. On the other hand, it has been documented that there is a direct interaction between PKCa and Cav1 , and that activation of PKCa on the plasma membrane is required for C. neoformans invasion into HBMEC . The relationship between Cav1 and PKCa for C. neoformans invasion is interesting, but still needs to be further elucidated. One interesting question regarding C. neoformans invasion is that the C. neoformans cell is able to hijack the endocytic signaling in HBMEC in order to facilitate its internalization . Notice that endocytosis comprises multiple mechanisms, i.e., caveolae-dependent, clathrindependent, pinocytosis, macropinocytosis, and phagocytosis [17-20,30]. In this report, we first demonstrated the involvement of Cav1 in C. neoformans infection. Perturbation of Cav1 function by knockdown of Cav1 (Figures 3 and 4) can substantially reduce the ability of fungi to invade HBMEC. Cav1 is the major protein constituent of caveolae . Thus, our results support the notion that C. neoformans may utilize the lipid raft/caveolae endocytic pathway for its invasion. Caveolae are small invaginations in the plasma membrane that mediate multiple functions, including signal transduction and endocytosis [19,30]. Increasing evidence shows that pathogens are able to use lipid rafts or caveolae as cell surface platforms for interacting with, binding to and possibly entering into the host cells . Typical caveolae are 70 to 100 nm in diameter. Sphingolipid binding toxins (cholera toxin CTxB and shiga toxin) and viruses (including SV40) can be carried inside the caveolae cargo, whereas bacteria (> 1 μm in diameter) are much larger than caveolae, which might thus not be suitable to accommodate their engulfment. In this case, the caveolae do not provide the entry route per se , but offer signaling platforms required for the bacterial invasion. The size of C. neoformans is ~5 μm or larger in diameter, depending on its capsule size. It is conceivable that entry of this organism is mediated by its association with lipid rafts, rather than by its enclosure within caveolae per se, and that host Cav1 plays a crucial role of C. neoformans invasion into HBMEC. We further studied how Cav1 was involved in this invasion process. It has been proposed that, upon the ligand interaction, Cav1 is activated through its phosphorylation regulation [27,28]. 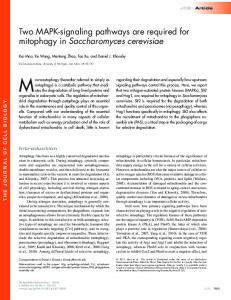 However, the regulation of Cav1 by phosphorylation is poorly understood in the field of the pathogen infection. In our studies, we have found several novel observations about Cav1 phosphorylation regulation. First, phosphorylation of Cav1 is enhanced in the presence of C. neoformans. The peak of phosphorylation is around 10 min at the fungal-host engagement (Figure 6), suggesting that Cav1 is involved during the C. neoformans infection. Secondly, the Cav1 phosphorylation is HA-dependent (Figure 7A), presumably, through the C. neoformans HA to HBMEC CD44 signaling pathway. Thirdly, phosphorylation apparently starts from the lipid rafts, as filipin treatment can reduce its phosphorylation level (Figure 7B); thus, its phosphorylation, most likely, triggers a dynamic internalization process there. Fourthly, a major finding of our study is that the Pi-Cav1 signal is observed as the thread-like structure inside the HBMEC, and this structure is colocalized with b-actin filaments, not with tubulin (Figure 8). It is known that Cav1 can associate with many proteins through its CSD domain, including actin-binding protein such as filamin [35,36]. In this scenario, activated Cav1 (PiCav1) may be associated with b-actin through this binding domain and internalized into HBMEC. It is tempting to speculate that other signaling molecules may also be internalized via binding with Pi-Cav1 in a similar manner. Thus, Pi-Cav1 may carry certain signaling molecules with it during the internalization process. This speculation remains to be demonstrated. localize caveolin interacting signaling molecules within caveolae membranes. Our results support a transcellular mechanism for C. neoformans invasion. We are currently investigating Cav1-associated signaling molecules and Cav1 regulation to unravel the profound invasion mechanism of C. neoformans. Acknowledgements We thank Jennifer Liu for critical reading. We also thank Dr. Casadevall for providing us with the anti-GXM monoclonal antibody (#18b7). This project is financially supported by Public Health Service grants R01-NS047599 (A.J.) and R01-AI40635 (S.H.H.). Author details 1 Divisions Hematology-Oncology, The Saban Research Institute, Children’s Hospital Los Angeles, Department of Pediatrics, Keck School of Medicine, University of Southern California, Los Angeles, CA 90027, USA. 2Division of Infectious Diseases, The Saban Research Institute, Children’s Hospital Los Angeles, Department of Pediatrics, Keck School of Medicine, University of Southern California, Los Angeles, CA 90027, USA. 3Department of Microbiology, Southern Medical University, Guangzhou, China. Authors’ contributions ML and CW performed immunofluorescence microscope. SHH carried out Western blots and statistical analyses. GMS studied the phosphorylation. AJ designed the experiments, and he is the principal investigator of this project. All authors read and approved the final manuscript. central nervous system via transcellular penetration of the blood-brain barrier. Infect Immun 2004, 72:4985-4995. Oka N, Yamamoto M, Schwencke C, Kawabe J, Ebina T, Ohno S, Couet J, Lisanti MP, Ishikawa Y: Caveolin interaction with protein kinase C. Isoenzyme-dependent regulation of kinase activity by the caveolin scaffolding domain peptide. J Biol Chem 1997, 272:33416-33421. Schelhaas M, Malmstrom J, Pelkmans L, Haugstetter J, Ellgaard L, Grunewald K, Helenius A: Simian Virus 40 depends on ER protein folding and quality control factors for entry into host cells. Cell 2007, 131:516-529. Pelkmans L, Burli T, Zerial M, Helenius A: Caveolin-stabilized membrane domains as multifunctional transport and sorting devices in endocytic membrane traffic. Cell 2004, 118:767-780. Popowicz GM, Schleicher M, Noegel AA, Holak TA: Filamins: promiscuous organizers of the cytoskeleton. Trends Biochem Sci 2006, 31:411-419. Stahlhut M, van Deurs B: Identification of filamin as a novel ligand for caveolin-1: evidence for the organization of caveolin-1-associated membrane domains by the actin cytoskeleton. 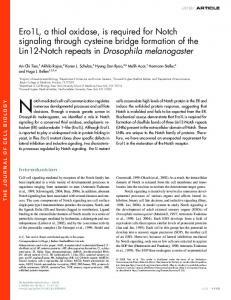 Mol Biol Cell 2000, 11:325-337.
doi:10.1186/1423-0127-19-19 Cite this article as: Long et al. : Lipid raft/caveolae signaling is required for Cryptococcus neoformans invasion into human brain microvascular endothelial cells. 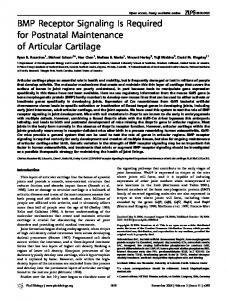 Journal of Biomedical Science 2012 19:19. 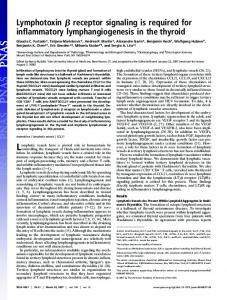 Report "caveolae signaling is required for ... - BioMedSearch"